In the curious case of this nearly-forgotten adaptation of Carrie, it’s not so much the years that have been kind to it, but rather the context. When it aired in 2002, Bryan Fuller’s redux was in the unenviable position of updating the first—and, for my money, the best—Stephen King adaptation ever, and with network constraints to boot. In 2015 and in the shadow of the most recent remake, we know this sort of thing can be much more uninspired than this particular effort. While it’s tough to argue that this Carrie has been unfairly lost to time, it’s at least more intriguing than the latest pass from a couple of years ago, if only because it tries to step outside of De Palma’s shadow just enough after it's finished wallowing in it. Then again, how could it not wallow, right? From its casting decisions to his dazzling camerawork De Palma’s take is so forcefully iconic that it’s destined to inform this particular tale in perpetuity. Obviously, it hasn’t stopped folks from giving it another shot, and, if your definition of a faithful adaptation involves the most adapting, then Fuller’s screenplay is technically more beholden to King’s novel. Specifically, its somewhat unwieldy structure is somewhat mirrored by the film’s frame story: some weeks after the inevitable catastrophe at Ewen High School, the sparse survivors relay their version of the events leading up to the ghastly prom night massacre. The details you know: after a shy, bullied girl named Carrie White (Angela Bettis) has her first period, her classmates—led by ringleader Christine Hargensen (Emilie De Ravin)—tease her unmercifully. Only her gym teacher (Rena Sofer) and conscience-ridden classmate Sue Snell (Kandyse McClure) eventually stick up for her. Even her principal almost comically misremembers her name in a bit that’s virtually lifted straight from the De Palma. So, too, are the other familiar touchstones, like “plug it up” and Carrie telekinetically shoving a taunting kid on a bike on her walk home. Sue’s eventual peace offering—to set Carrie up with hunky Tommy Ross (Tobias Mehler)—and her fundamentalist mother’s (Patricia Clarkson) subsequent freak-out dutifully retrace all the familiar steps. Many of the narrative diversions are minor and serve to fill in character details. A flashback to Carrie’s childhood encounter with a teenaged neighbor is a nice addition from King’s novel, as are the increased number of interactions between her and her classmates. At 130 minutes (the film originally aired as a mini-series), it leaves few stones unturned, even if those stones only yield superfluous stuff and sort of confirm the masterful leanness of De Palma’s adaptation. It's sort of fitting that this version is a bit wild and ragged—in many ways, King’s novel is as well, so something about it just feels right. Maybe Fuller doesn’t completely capture King’s sprawling narrative (parts of which are set a decade after the fateful prom night), but he does just enough to alter the tone: this Carrie is less a fatalistic melodrama and more of a procedural (at least until it reaches the massacre sequence, at which point it’s all overheated, overblown drama). Clarkson’s muted turn as Margaret White is an obvious departure in this regards. Whether it was an intentional choice to get away from Piper Laurie’s iconic, deranged performance or a constraint from a network skittish about highlighting religious fanaticism on prime time, this Margaret is more low-key and reserved, her command to “go to your closet and pray” becoming something of a sinister refrain hinting at a psychosis that barely bubbles to the surface. It’s not a striking performance, but it’s one that works within the confines of this story: Carrie is a story about repression, so it follows that one of its villains simmers to a boil. In this respect, Margaret and her daughter are similar, and Bettis’s performance is similarly low-key. Bettis was nearly 30 years old at the time of filming, something I note not for its humor but for its aptness. She never feels like she quite belongs among her younger cast-mates in both her subtle maturity and her appearance. During this same year, Bettis would make her signature turn in May as that film’s terminally awkward title character, and you can see obvious echoes with Carrie, another loner who longs for acceptance. Even as she slowly gains confidence, there’s a measure of caginess to her that Bettis expresses with small gestures, such as her hesitation with Tommy during a slow dance. If this version of Carrie separates itself in any noticeable way, it’s in Bettis’s distinguished approach: she’s not as outwardly weird as Spacek, nor does she stretch believability in the role like Chloe Moretz did. On the whole, Fuller’s cast reads like a who’s who of early 2000s talent, many of whom went on to become familiar faces. In addition to Bettis, the film features De Ravin as a perfectly snotty Chris, while Sofer is a tough, feisty Desjarden. McClure is an intriguing Sue Snell, as she brings the right mix of caginess and sincerity to an underappreciated, sneakily complex role. Here more than ever, Sue’s our anchor, as the bulk of the story is told from her point of view during a police interview where she pleads her innocence in the prank that destroys a small town, a story decision that has the audience sympathizing with two characters. Rounding out the cast is the always noteworthy Katharine Isabelle (coincidentally one year before she would pay homage to PJ Soles’s Norma Watson in Freddy vs. Jason) as one of Carrie's outrageously catty bullies. You love to hate her so much that her grisly fate feels like just comeuppance. But with its refreshing cast and some of Fuller’s updated teenage lingo, Carrie just can’t quite shake the film that came before it, not when it’s essentially running right back to it by the conclusion. For much of the running time, director David Carson embraces the flat, unimpressive TV aesthetic: his direction is far from static, but it is so obviously a product of an era when the line between cinema and television had yet to blur. That is, until the climax, when it's suddenly well-lit, atmospheric, and impressively staged (even though, again, it is cribbing heavily from De Palma’s playbook), a transformation that mirrors its title character’s makeover. Considering the obvious restrictions, the prom massacre is an intense, terrifying retread that amps up the scope and scale to the levels King imagined (in the novel, Carrie’s outburst is a national tragedy because it claims thousands of lives). It’s here that comparing it to the latest remake does it few favors: if the ethos behind that film was “let’s do De Palma but add iPhones and a shitload of CGI,” then this is at least guilty of the latter, only it doesn’t have nearly the resources at its disposal. If you found the digital work in the recent Carrie to be unsightly, you can imagine how it looks with 2002 technology. After the bucket of blood soaks Bettis with an almost balletic grace, Carson orchestrates a clumsy display of exploding gas stations and flipping cars. In this case, though, it feels like a case of thwarted ambition, particularly since Fuller and company seem more invested in their characters than the Pierce film, which resorted to CGI out of pure spectacle. There, it was expected; here, it’s barely functional but effective since this film takes an intriguing turn that would have had its characters deal with the fallout had this backdoor pilot spawned an actual series. Obviously, that did not happen, and it leaves Carrie in an awkward place that at least makes you wonder just how feasible a weekly show would have been. Clearly, Fuller had a fondness for these characters and intended to explore themes of bullying and acceptance in a way that would have taken King’s work in an entirely new direction—which is to say, at least it would have maybe gone somewhere besides where it had already been 25 years earlier. In the end, this film’s commercial failure only further guaranteed it would never outrun its predecessor. At least it wasn’t for lack of trying, though, which is more than can be said about the 2013 film. Scream Factory has at least given Carrie a new lease on life with a new Blu-ray edition. While the transfer looks okay (especially as the film itself becomes more slick and stylish), it should be noted that the original 1.33:1 aspect ratio (which is incorrectly listed on the back cover) has been widened to 1.78 widescreen, an alteration that inevitably results in a different image from the original broadcast. DTS-MA 2.0 and 5.1 options are available, and a third track features a commentary with Carson. 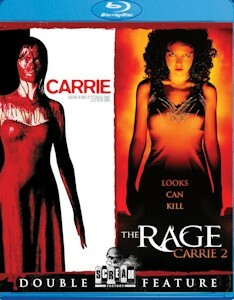 It and the film’s trailer are the only supplements, but the disc pairs Carrie with The Rage: Carrie 2, the bizarre (and random) 1999 sequel to De Palma’s film, which is like a bonus feature in and of itself. 13 years after its release, the context of Fuller's career has changed our approach to his pass at Carrie. Given his career trajectory from Deep Space Nine writer/producer to one of Hollywood’s most distinguished (yet still underappreciated) talents, it’s a worthwhile curiosity piece that reveals his penchant for translating horror to the small screen. Its failure was both an early stumbling block and a harbinger for a decade marked by thwarted ambition: between Wonderfalls and Pushing Daisies, he created two of the most distinctive, bizarre television series of the aughts. Carrie further reveals his peculiar obsession with misfits trying to do right by society in the face of the macabre. It would take a decade until he would more successfully explore this with Hannibal, but Carrie provides a hint of that same ambition, particularly in the character relationships that would have defined his series. Ultimately, you’re a little bummed out that you didn’t get a season or two of Angela Bettis’s Carrie travelling from one town to the next, visiting and helping her fellow outcasts and weirdoes alongside Sue Snell. Even if we're only left with these good intentions, at least Fuller was ahead of his own curve here.